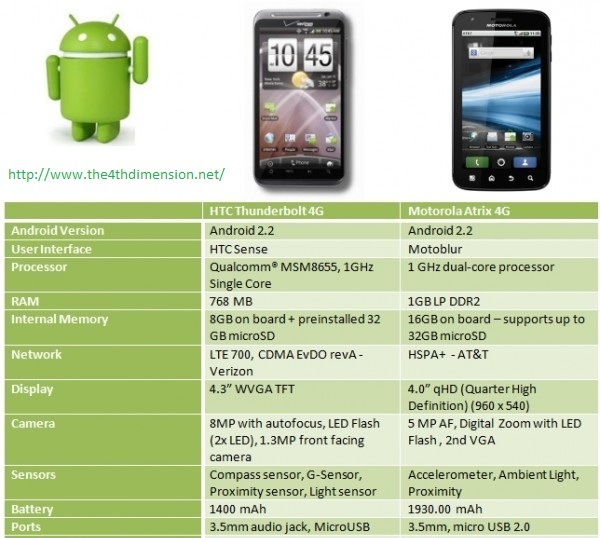 So here goes the comparison between upcoming 4G mobile handsets HTC Thunderbolt 4G and Motorola Atrix 4G. Both of these phones are the best of the best in the Android world currently, and I have no problems with either. They are each as capable as a phone can be, more so in fact as they are both full-blown handheld computers. The Atrix has special docks available to turn the phone into a laptop and a multimedia nettop computer, at extra cost. I have no qualms recommending either of these phones to those in the market for a good Android smartphone.